Since the reform and opening-up, apparent and serious economic disparity has existed between the eastern coastal region and the inland area, especially western China. Such unbalance adversely influences the sustainable development of China’s economy. In order to resolve this chronic problem, Chinese government proposed related policy as well as developing logistics system and transportation infrastructure which are bottlenecks for economic development of western China. Xinjiang, as an important gateway in the west for inland area of China, plays an indispensible role in national logistics development. For the purpose of optimizing distribution network in the west part, China has made immense investment in the Gwadar Port construction of Pakistan. 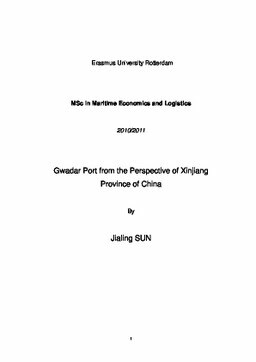 Thus, the objective of this thesis is to analyze the importance of Gwadar port development from the perspective of Xinjiang Province of China. Based on literature review, this thesis presents the status of economic development, transport system development and dry ports development of China, especially the western part. By adopting SWOT analysis method, this thesis specifically analyzes the various internal and external factors that affect Gwadar Port development from the perspective of China. Actually, the development of Gwadar Port will bring about a wide array of benefits not only for Pakistan, but also for China, especially logistics optimization of inland China. In addition, the establishment of Gwadar port in Pakistan significantly stimulates logistics improvement of inland China, especially that of Xinjiang Province which is connected with Pakistan by Karakorum Highway. And their benefits are mutual, namely Xinjiang also plays an important role in Gwadar Port development. Notwithstanding that, dry port which improves efficiency of transport as well as enhancing connection between hinterland and ports still needs to be developed in Xinjiang for further optimizing distribution network of China. This thesis provides an overview of logistics status in western China and makes a contribution to the scare research on the logistics development situation in the west of China. However, due to limited number of related academic research and relevant data, this thesis mainly focuses on qualitative analysis instead of quantitative analysis.